What’s fulfillment? The opposite of emptiness. A sense of satisfaction, meaning and connection. That’s how I’d define it. When you have it – you know it. Maybe it’s when you won a game, overcame a challenging situation, when you feel one with another person. When it’s missing you feel: well… “something is missing”. But what? What exactly is missing? And how can we get it, find it, create it? The first step: ask yourself what’s missing. What would fill the emptiness? What happens if we don’t ask the questions? Have you ever end up overeating, over drinking , online shopping excessively, or numbing out – than you know the consequences. We take the easy road to fill the emptiness, except we try to fill it with wrong things. Things that have no ability to give us what we want. When we feel empty, lost our purpose, and our relationships are more frustrating than satisfying, our default response is to attempt to fill the emptiness with anything. And because we don’t feel good, we are not going to choose what’s good. I noticed it can happen daily. The second step: Realize you are responsible for your fulfillment. To wait for others to give us what we want, is to set ourselves for bitter disappointment. Sure it can happen, but if we depend on it – we feel out of control. The nature of fulfillment is – we need to put effort in it. It may be daily work aligned with your values and dreams, it may be surrender. When things are given to us, without any effort on our side, they are not going to be fulfilling. At least not for long. Lasting fulfillment is created thru our work and inner work. And the starting step is to BE WILLING. Be willing to work for it, be willing to change perspective, be willing to use your mind and body towards its purpose. These are the starting points to create fulfillment. What will fulfill you – only you know. And I get it: sometimes we don’t know. Partially because we haven’t experienced it YET. So if it’s hard to figure it out, check out the list below. I’m pretty sure it encompasses everything. If you don’t find on it professional ambition it’s because it’s hidden under “expression”. If you are not finding on the list “romantic relationship” it’s because it’s under “connection,” and who knows? maybe “spirituality”. I am going to expand on them in the future posts. Where does the paths come from? 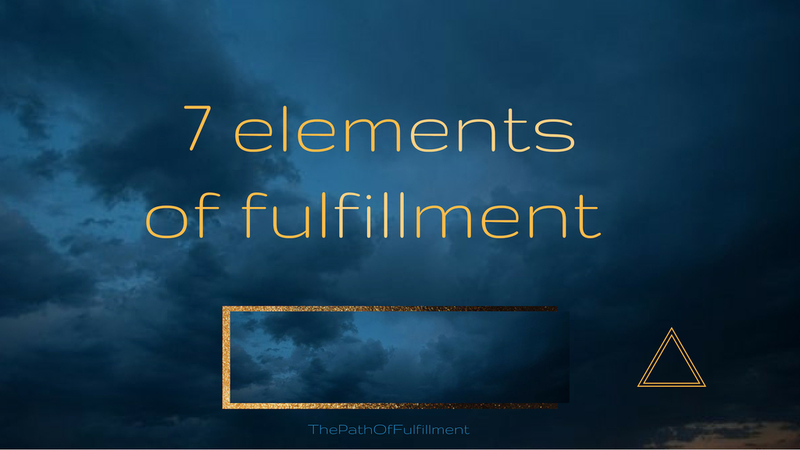 Originally I thought of these 7 elements of fulfillment as 7 cures to get out of funk. Then I noticed: when you climb out of depression, to the surface of life, you can use them again to create more energy, passion, and zest for life. Which of the above calls you most? In addition to the above, I would look at which two top 6 human needs* are most important for you? What gives you reason for living? Make an effort. Make it effortless. The search for fulfillment cannot become a task that overwhelms us. At least I don’t think so. Too often I run myself into a corner overthinking what cannot be resolved in an intellectual way… I need to remind myself regularly, to let go, surrender, and return to the state of flow and ease. Because the way of ease brings us gifts that we won’t recognize in any other way.